There is justifiable anger at the recent deaths of children in a UP hospital. These deaths are undoubtedly a case of criminal negligence of the Hospital authorities and those in Government who are responsible for supervising the hospitals and managing the encephalitis epidemic in the State. The negligence is directly responsible for snatching away the lives of these children who deserved a better childhood and a better life. This comes after the outbreak of a dengue epidemic in the state of Kerala that has claimed over 400 lives, many of which were children. Predictably, there is the usual political potshotting that, nowadays has become the norm. But there is also anger and outrage at what is happening in public health systems in various states - right from UP to Kerala. But it is important that the anger does not peter out and these deaths are not forgotten as is the case for the many thousands of child deaths across the country in the years before. The spotlight and discourse should move and stay on the real problem of rampant corruption, apathy and negligence of the Government in health-care systems in most of ours states. Our constitution through Article 21 bestows a right to Life and Liberty on every citizen and creates a reciprocal obligation/duty on the state to provide proper healthcare facilities to the citizens. The Supreme Court, thorough various judgments, have given a wider interpretation to Article 21 and has also read Right to Health as a part of Article 21. In the last over a decade I have served in Parliament, there has been little or no real debate and assessment of our healthcare system. I suspect its same in state assemblies everywhere too. Its time we politicians changed this apathy and lack of debate and scrutiny about such an important issue that affects every man, woman and child regardless of religion or caste. The current anger should move towards ensuring accountability of State Governments for fulfilling this obligation and citizens’ right to life. That means fixing the rotten, broken and corrupt public health administration and delivery system. This is critical because for the vast majority of Indians, Government hospitals and PHCs are the only source of healthcare and treatment. The crimes committed against children and the failure of the State to tackle the problem are on public display. As per a May 2017 factsheet by the World Health Organization (WHO), diarrhoea remains the second leading cause of death in children under five years, killing an estimated 321 children every day in 2015. Out of 132 nations, India ranks 114th in stunting, which refers to low height for age, and is a sign of malnutrition. It is shameful that even after 70 years, Diseases and Epidemics like fever, dengue, malaria, leptospirosis, hepatitis (A and B), diarrhoea, chickenpox and H1N1 continue to claim lives, adding to the existing misery of children and parents across the country. 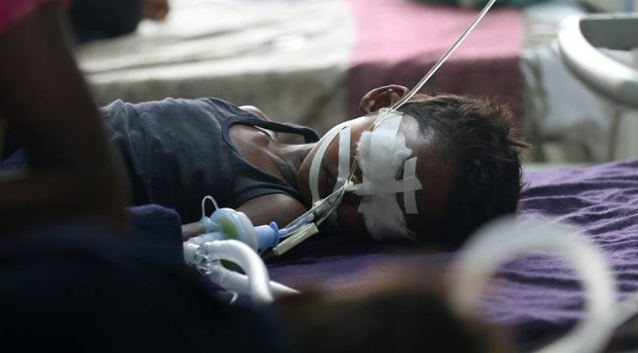 In UP, outbreaks of encephalitis that claimed the lives of children, seem to have been a regular feature – with no one in past Political leaderships or Governments ever tasked with better forecasting and prevention. This is as much a part of a political responsibility as delivering emergency medical care AFTER the outbreak. Unfortunately, there seems to have been years of unrestricted apathy in upholding the spirit of the Constitution and the Millennium Developmental Goals. The anger, therefore, is justified as we mourn the deaths of children. Way back in 2005, in the same BRD Medical College over 1500 encephalitis deaths occurred where 90% of them were children. Almost 2500 to 3000 encephalitis patients are admitted in BRD Medical College every year. Questions must be asked and answers given on why this situation continued for so long. The current broken Government Health administrative and delivery system in many states are characterized by total lack of Accountability, Corruption, Sub-standard treatment, non-functioning health facilities and medical negligence. This is a perverse situation given that some of our best doctors, surgeons and nurses are in the Government Medical system and points out the problems existing with the bureaucratic administration and Political system. The challenge for the nation is to translate into reality the vision of having an Accessible, Affordable and Equitable health-care FOR ALL. The uproar caused by the recent deaths in UP and Kerala must not die down in a few days. A sustained debate and Political leadership is required on reforming and transforming public health care systems around the country – jettisoning 70 years of apathy and corruption with renewed and responsive, reliable, patient centric network of Government health care delivery. A new type of Political leadership of healthcare is needed - which is more consistent with the high priority deserved for health and well-being of all Indian. Amongst things to be done by this political leadership is creating an quarterly oversight and report carding process of the system overall and each and every healthcare center - private and government. A new cadre of Hospital administrators along with budgets and responsibility need to replace the current group of political cronies, corrupt and apathetic bureaucrats being responsible for health and well-being of our citizens. 70 years on, it is clear that we are failing our children and others – This is another compelling reason for a reboot of our democracy and get about the task of Transforming India and creating a New India for our children’s sake.